Working hard for success is an old and invalid concept. 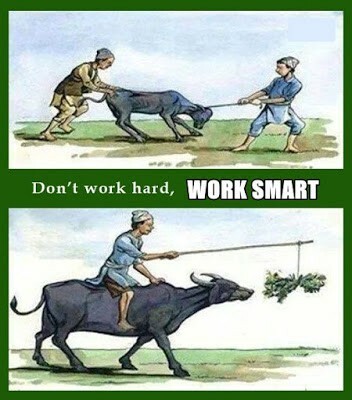 The purpose of working smarter is to accomplish the same or more without working hard. The best way of working efficiently is to optimize your brain functions. Our brains normally are capable of remaining focused for about 90 minutes, and then you need a break for at least 15 minutes. In the breaks, you must relax both your body of mind. Then brains will be re-charged. Taking a break may not be uncommon but taking naps seems uncommon. It is scientifically documented that naps improve our cognitive functions and creative thoughts. Naps help to consolidate memories and remembering new information. It, also, help your brains not to be exhausted. To keep your brain, function good, you need a regular workout and healthy diet. Healthy lifestyle increase work efficiency. Researchers suggest spending time in nature. Walking in a green park or a forest help your brain to relax. Your goal is to work less and lighter but to accomplish more than that you can do by working harder. To do that, you have to work systematically. I used to use works on my PC and search a lot for the information. I worked many hours without getting a good result. I hired a freelance software program. The programmer created and customized a couple of software programmers for me. I have now all workspaces in one place. I have all necessary programs in one place. I have got my analysis tools customized for my needs. Now I get more output in brief time. I am slow in typing. I tried voice-controlled typing. But the program does not understand my Indian English well. I, therefore, use more phone calls than writing emails. It helps a lot if we could avoid social media in work. After I have stopped using social media during work, my work efficiency has been improved significantly.